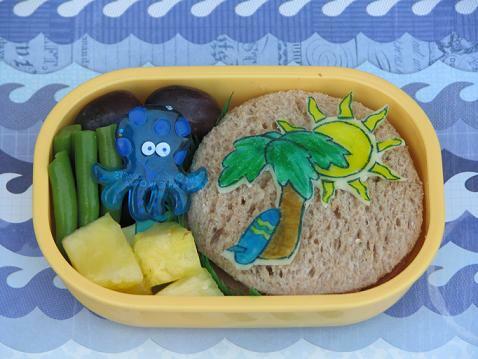 Tropical scene of cheese and food color markers sits on a soy ham sandwich. On the side are grapes, green beans, pineapple, and a little octopus pick that we found in a cupcake! I'm going to take a tiny bento break for the next week but will be back the week after because Kidlet is going to Camp Invention and will need a bento every day for that! Cute holiday bento! We'll miss you and your bentos! Have fun! Congratulation Kidlet! !^0^ The blue octopus is SO cool. Nice background for the octopus! What a fun end of year theme and your bento fits perfectly! Yeah to Kidlet for making it through 3rd grade! Perfect for a Luau and am loving the octopus pick!